Autarky offers a scrumptious range of naturally balanced and nutritious recipes formulates by one of Britain’s leading canine experts. Each bag contains nothing but the finest ingredients. 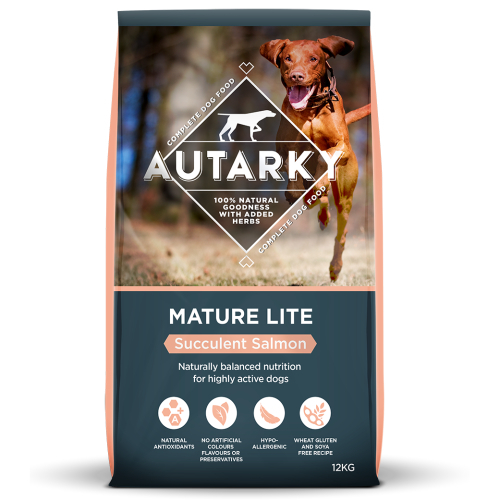 Autarky Mature Lite Salmon has been specially formulated to provide your older dog with the optimum nutrition he needs. This recipe is hypoallergenic, grain & wheat gluten and soya free. It helps to maintain a healthy body weight and good mobility, plus it’s ideal for fussy eaters. •	Helps maintain a healthy body condition as dogs enter their senior years. •	Provides nutritional support for joints and cartilage, helping to retain good mobility. •	Premium quality salmon providing full flavour perfect for fussy eaters. •	Free from artificial colours, flavours or preservatives.